We change lives! 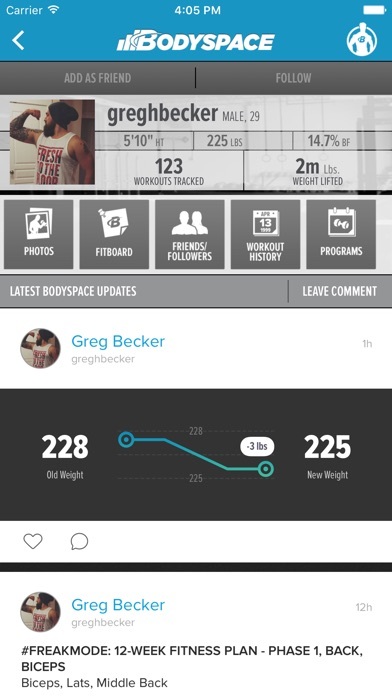 BodySpace is a revolutionary social fitness platform. It’s the best personal trainer combined with the world’s largest online fitness community. 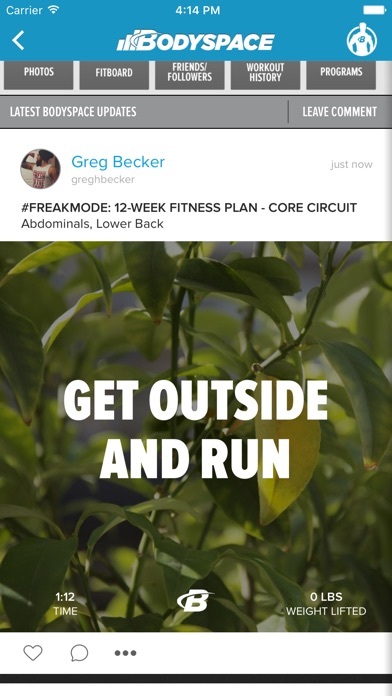 It’s a complete system of innovative workout tools, cutting-edge trackers, fresh content, and social features designed to help you become your best self. The best fitness app, BodySpace is the bridge between dream and do. It’s your ongoing transformation station. Pick a training program that is perfect for you: • Choose from one of dozens of BodySpace programs built by PhD's, Professional Trainers and Athletes such as Jim Stoppani, Kris Gethin, Jamie Eason, Ashley Conrad, Lee Labrada and many more. • Choose from one of our thousands of top rated Community built programs. • Choose the program that is perfect for you based on your goal, experience level, gender, age, duration or number of workouts per week. • Apply the training program to your BodyCalendar and get a daily to-do list with reminders. Not ready for a full training program? No problem...start by simply finding the perfect workout: • Choose from thousands of workouts created by BodySpace and our Community. 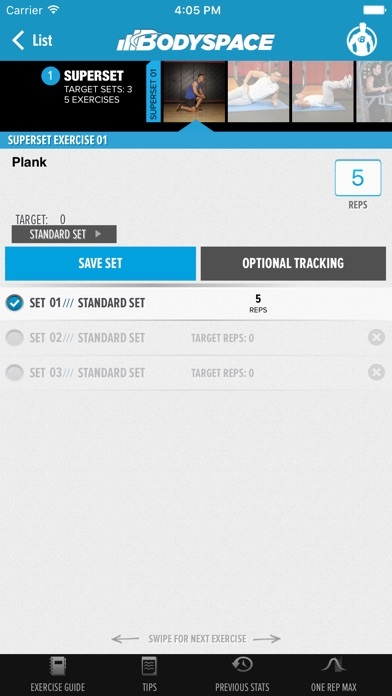 • Locate your workout by goal, experience level, gender, age, duration, cardio and muscles targeted. Explore the thousands of exercises in BodySpace: • Find the perfect exercise based on exercise type, muscle group and equipment. • Watch the instructional video or read through the step-by-step instructions. • Sort the exercises by our Community ratings. Fitness Tracker: • Track all the details of your workouts with exercise tips, videos, previous stats, rest-timers and more. • Watch as your workout stats (weight lifted and cardio times) hit millions of pounds and hundreds of hours. • Integrate with Apple Health App to stay current on all your fitness stats and goals. (Settings > Health Data) Ready to add supplements to your transformation? • Shop Bodybuilding.com's massive selection of top brands directly from BodySpace. Looking for others to help you meet your health and fitness goals? • Ability to manage your BodySpace friends & followers. • BodySpace news feeds from your friends & followers. Love how it stores my history of previous reps. A must have for lifting. I’ve had this app since 2015 - it’s an awesome way to hold yourself accountable to the gym and to learn how to use gym equipment if you’ve never stepped foot in a gym in your life! There are step-by-step videos, photos, and descriptions of each workout. Goal-driven fitness programs that lay out exactly what days are for what. Spots to load progress photos and weight tracking. And an overall kind, encouraging community of people rooting you on, commenting on your workouts, offering advice if you have questions. 10/10 would recommend to people looking for a place to start in the sometimes-daunting fitness world! Some things I wish they would add is a less direct search; not all gyms have all the same equipment names, so if you misspell the exercise you are doing or have a different name for it, good luck finding it. The app can be glitchy and doesn't always allow to mark as completed. Other than that, the videos are useful and the social media aspect of it is helpful. 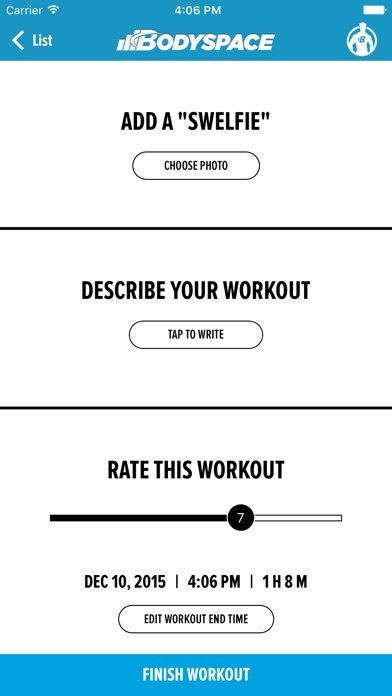 The only thing this app needs is an ability to leave notes in the workouts. Something to be able to reference a thought on a lift from your last workout. Example: if I did deadlift one week and was feeling bad during the lift, I could leave a note for next time I do deadlift letting myself know what my issues were last time. I really love BodySpace it’s something to keep you accountable with like minded individuals! Always nice to track workouts and maintain proper rest intervals! Like a lot BUT don’t love. WHY IS IT STILL NOT APPLE WATCH COMPATIBLE????????? I LOVE THIS APP!!!! It has motivated me in so many different levels!!! Love that I can see others progress who are in the same journey as me! 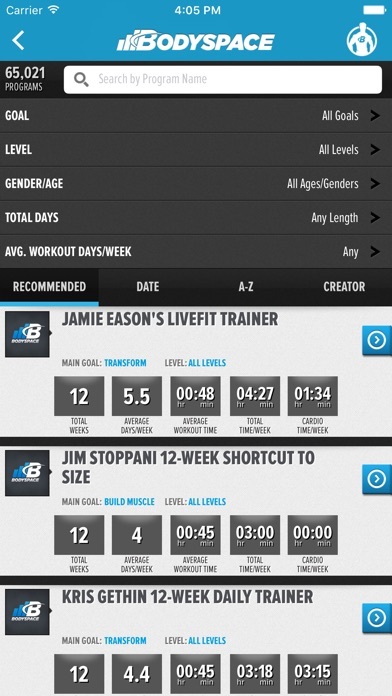 To get the full benefits of this App you need to get the All Access from bodybuilding.com as well! I promise you won't regret it!